The orangutan is one of the most fascinating of the great apes. 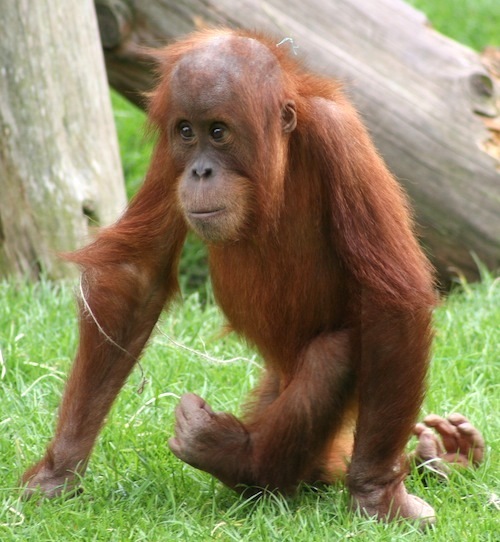 There are two main types of orangutan; the Sumatran and the Bornean and they are both from Asia. They are often part of behavioral studies because they are considered one of the smartest mammals in the world. These apes are very smart with a thinking process that is comparable to the rest of the ape species. They have such a high level of intelligence that it manifests in the use of tools within orangutan social groups. The tool usage can be idiosyncratic or what appears to represent cultural traditions within specific orangutan societies. The orangutan has been seen making tools simple to use for scratching themselves. They have also been seen using branches to shelter themselves from the rain and sometimes drape leaves from themselves like a poncho. Moreover they use branches to forage for insects, gather honey and to ‘fish’ for unreachable fruit. It is also being discovered that orangutans have a culture. Dr. Birute Mary Galdikas found twenty-four behaviors present in certain populations of orangutans but not in others. The habits are learned from other group members and passed along. One thing that was noticed was the different ways two different groups used leaves; one for gloves the other for wiping their chins. Another surprising behavior orangutans have is nest building. Sometimes, twice a day an orangutan will construct a new sleeping area. One time for an afternoon nap and the other for their bedtime and nearly every time they are fresh. These are generally about 15 or even 100 feet high in a tree. The orangutan is the largest animal in existence that is arboreal or lives in the trees. They spend nearly sixty percent or more of their time foraging for food and more than 90% of their food is found in tropical canopies. It only makes sense that these amazing creatures stay in the trees. They are an animal that is primarily solitary. A flanged (sexually mature) male is the most solitary staying alone most of the time. Any socializing a flanged male does is usually interacting with groups to find a female to copulate with. A mother and her children can form another small group. Additionally, sub-adolescent males and females will form their own groups. The adult males get what’s known as flanges on the side of their face. They are pendulous laryngeal sacs from which they can make a long call to attract potential mates. The sound is referred to as the ‘Long Call’ and it is part of the courtship process. The long call not only alerts any available females, it will also warn other males that this area is owned. Sexually mature male orangutans are completely intolerant of one another and that can result in heavy battles. The mother baby relationship of an orangutan and her baby is the most complex short of human nature. The baby is completely dependent on mother for everything for nearly two years. The mother has a menstruation every 29- 32 days and it lasts for three or four days. When she is pregnant she will be so between eight and nine and half months. A female doesn’t become sexually mature until she is 12 or older. When a baby is born it will depend on its mother for everything. She will need to carry it as it won’t be able to easily walk. 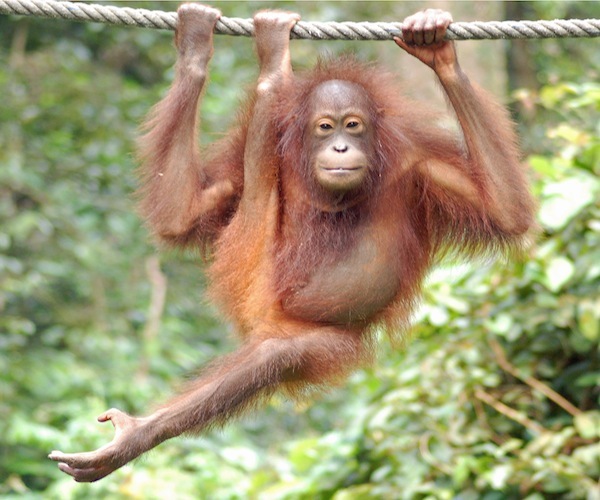 Orangutans have the longest infant development period of all the great apes.